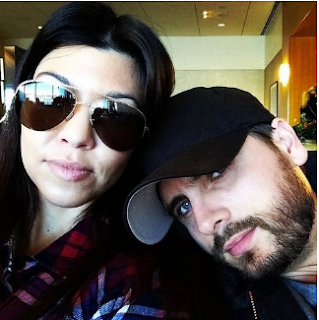 Kourtney Kardashian demanding drunkard baby daddy Scott Discick enter rehab. KOURTNEY KARDASHIAN is demanding that baby daddy Scott Disick get help for his drinking problem after he made a drunken spectacle of himself at a recent Kanye West concert. Sources say 30-year-old Scott – who went to rehab in 2010 for boozing – has been hitting the bottle hard ever since his mother, Bonnie, died in October, following a long illness. “Kourtney’s beside herself,” a family insider told The ENQUIRER. “She was giving him time to grieve, but now he’s drinking with a vengeance. Scott was reportedly spotted on Dec. 6, flirting drunkenly with a brunette at a Beverly Hills hotel. And then, on Dec. 7, came the final straw for Kourtney, 34. Scott was spotted swaying, staggering and looking bleary-eyed at future brother-in-law Kanye’s concert in Houston. Just a week earlier, Scott – who has two kids with Kourtney, 4-year-old Mason and 18-month-old Penelope – was partying it up in Arizona, where he was seen pouring vodka shots over college students at a Tucson bar. In November, he ran up a $15,000 bar tab at a birthday party for DJKhaled in Miami. And a month earlier, he was so wasted at a fashion show he attended with Kourtney’s younger sisters Kylie and Kendall that one of the models flipped him the bird!